So you’ve learned how to brew Kombucha, in fact you have a supply readily on hand. If you have more Kombucha than you can drink, there are a number of ways to put the extra to good use, but the best is probably a Fruit Fly Trap. Fruit flies (aka Drosophila melanogaster) can be pesky the warmer it gets, making a trap particularly useful in the summertime. A little Kombucha in a shallow dish can solve your kitchen’s fruit fly infestation in a snap. Check out the Advanced Tip, especially if you have a garden to grow. Get Rid of Fruit Flies with Your Leftover Kombucha! A dish – this can be made from any material as you won’t be drinking from it. Add a drop of soap. The drop of soap reduces the surface tension which causes the bugs to fall in but prevents them from flying out. If you don’t have any extra Kombucha, you can strain out the dead flies and reuse the liquid as needed. Kombucha fruit fly traps are not only useful in the house, but also outside in the garden. All kinds of insects are attracted to the sweet, sour smell of the ‘Booch. And once they fall in, they can’t get out! When the jar is full, I like to pour it into my composter or in the garden (acid loving plants only please!). The soil loves the pH of the KT and it helps the plants thrive. Check out this post for more Kombucha Vinegar uses. What other ways do YOU use extra Kombucha around the house? Good idea! Those traps take a little more effort to construct but can also collect a LOT of flies. Did it help keep down the population with the chickens? I also vacuum up the fruit flies 🙂 i find that after a couple days of continuous trapping the resistant ones reproduce and then it stops working. So, I’ll vaccuum flr a day or two then put a new trap out ! I am a fairly new brewer, and sure enough, fruit flies are attracted to my brewer. I am using a technique that I have been using with great success for years. I simply vacuum the fruit flies up! I do a sweep with the hose without the attachment at night, and if there are any more in the morning, I do it again. It is most satisfying to see the little buggers “leap” into the vacuum! And much preferable in my opinion to actually attracting them with booch. My kitchen is fruit fly free if I spend a few minutes vacuuming them every few days. When I make medb I save some of the mud for bug traps with a drop of soap.. Works the same way..
I’m brewing my second batch of KT.. The first surprised me it was so fizzy.. Good stuff.. I’d been hearing about it for years but never met anybody who was familiar lt.. Always thought I should try some.. I’ve got a few pounds to lose and saw mention KT helps to lose weight so I finally ordered some from EBay.. Then I found you.. Your recipe is very different from the one that came with my ‘mother’.. Your recipe and helps are great.. I just finished drinking my 1st batch of booch in about 5 years. I have learned a few flavoring tips which I did not know a few years back when I brewed. I have crushed a blackberry, and taken a thin slice of ginger root and put in each of my bottles. I then left them on the counter 3 days…and wow it tasted great! Before when I brewed I cleaned everything with apple cider vinegar instead of hot water, and my brew tasted vinegary. It is so much better now. Thanks for your many tips! Could you explain a bit more on how you get the worm tea out of the dustbin. Presume it sits on soil to attract worms? The hole in the bottom of the bin collects the worm “sludge” and then it drips into a plastic container at the end of the hose. We throw food scraps on top and then once a year, we turn out the stuff on top, spread the stuff on the bottom of the bin about the garden and then put the “top layer” back into the worm bin. Makes lovely compost! Interested in your composting, can you give me some info on it? Thanks! We do vermicomposting in a homemade bin. We converted an old garbage can by inserting mesh on the bottom and cutting a hole to capture the worm tea. Then we fill it with spent tea leaves, kitchen scraps and SCOBYs. The worms love it and they are continuing to thrive 4 years in! My KT is very dark. I used 8 tea bags to a gallon of water and 1 cup sugar. I am thinking my tea just may be too strong and perhaps I should cut down to 6. Will this hurt the brewing process? (Tomorrow is day #17 and time to bottle this batch) Thanks for all your help! This is fun. We recommend 3-6 bags of tea per gallon. If you like the flavor, that is most important but you can probably cut back on the amount of tea and still make a delicious KT and save some money in the process. If you are heating from the bottom, you could be over activating the yeast which can lead to imbalance and slower fermentation. What is the pH of your brew? What recipe are you following? Hard to troubleshoot without details. I have always placed a head of garlic at the bottom of my fruit bowl, and no matter how ripe the bananas get, the fruit flies stay away. Now that I am brewing, I place a couple of heads on my pantry shelf where I keep my brews, and viola! No fruit flies. Hello, can you tell me are you peeling the garlic or is it just the way you buy it from the store? I peel my own garlic. You are the greatest. In my house, KT never gets old enough to see better days. Usually I am fighting my kids over it. Thank you for all your videos. I love my kombucha. What is the recommended amount of kombucha that one can drink in a day? Can you drink to much? Just getting started on making it and we are getting a good amount ready at one time. It is recommended to start with small amount at first (4-8oz) up to 3 times a day. Then, Trust YOUR gut! Drinking “too much” will increase your need to eliminate and if you are new to detoxification, you may experience a Herxheimer reaction. Increasing the amount of water your drink will help to flush the toxins released. How long can the scobies stay in the hotel? Does the hotel stay in the refrig or on the counter? The SCOBYs can remain in the hotel indefinitely. Keep the hotel on the counter to prevent the cultures from going dormant. You will need to feed the hotel nutrient solution (sweet tea) from time to time to keep it healthy. We prefer to use a cloth cover – the new SCOBY that grows is essentially the “lid” and the cover prevents dirt or bugs from getting into the jar. Closed top will eventually have a funky odor due to “suffocating” the yeast. I found a few gnats (I think they’re gnats or fruitflies most probably because they’re so small in my kombucha on the scoby. What now? Do I not have the towel on tight enough or can it be because I let this batch brew longer and it’s stronger? Sometimes the lil buggers get in when you remove the cloth cover. Try to keep your KT covered at all times especially this time of year when they get pervasive. If you have a SCOBY Hotel, I’d compost the one with flies and start fresh. Hi Erol! Yes, we ship internationally! Can mother plant vinegar be used in making kombucha tea? MOV is not the same as the Kombucha culture. MOV has its own healing properties but does not contain the same yeast & bacteria that are present in KT. I have been using apple cider vinegar and dish soap for a few years before I even knew that kombucha existed. That works great and you don’t waste the precious kombuchia. It is to bad that I could not hear your voice though. The intro music was fine but no sound with the voice. Thanks keep up the good work!!!!!!!!!!!!! Thanks Lindy! I use KT that has seen better days for my fruit fly traps – that or KT from some random flavor experiments that may not have turned out as I would have hoped. KT almost never gets wasted here 😉 Brew long & prosper! This sounds great. 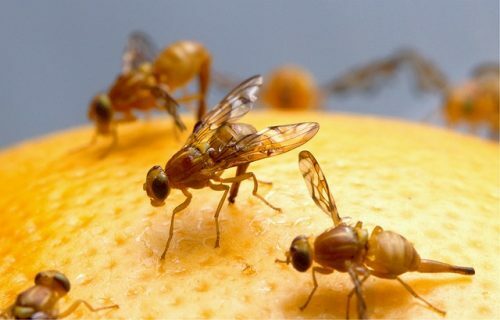 We have plenty fruit (and other) flies here in S.A !! Soon as the summer comes, along with all the pests,this will be my first mission! !